Hans Holbein the Younger (1497 – 1543) – was a German artist and print-maker who worked in a Northern Renaissance style.. When the Art Department at the University of Michigan acquired a vintage fragment of a “Holbein rug” for its permanent collection, this all-wool artifact, from the 16th Century, became a treasured piece of history for the institution. Complex patterns were typical of the detail the German oil painter Hans Holbein the Younger used when he painted the famous (and not-so-famous) members of society. But the Holbein rugs originated in the details he added to his paintings — background, clothing and antique rug patterns so intricate and complex that they became as famous as the people he memorialized. Holbein was mesmerized and fascinated by patterns he added to his portraits. 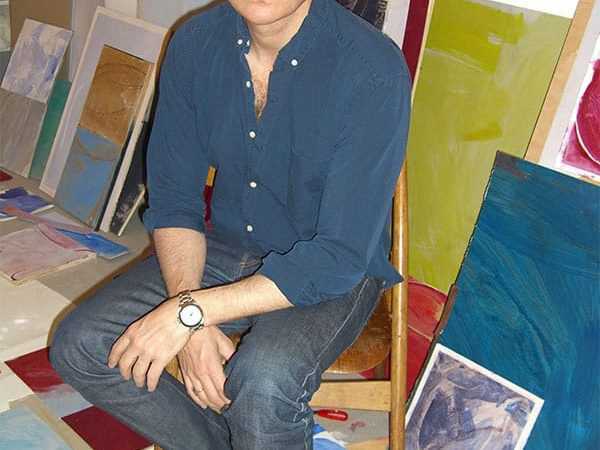 This was especially gutsy since the parochial religious constraints during his time were so stringent, that adding too much detail to a painting could land an artist in jail for any number of reasons. 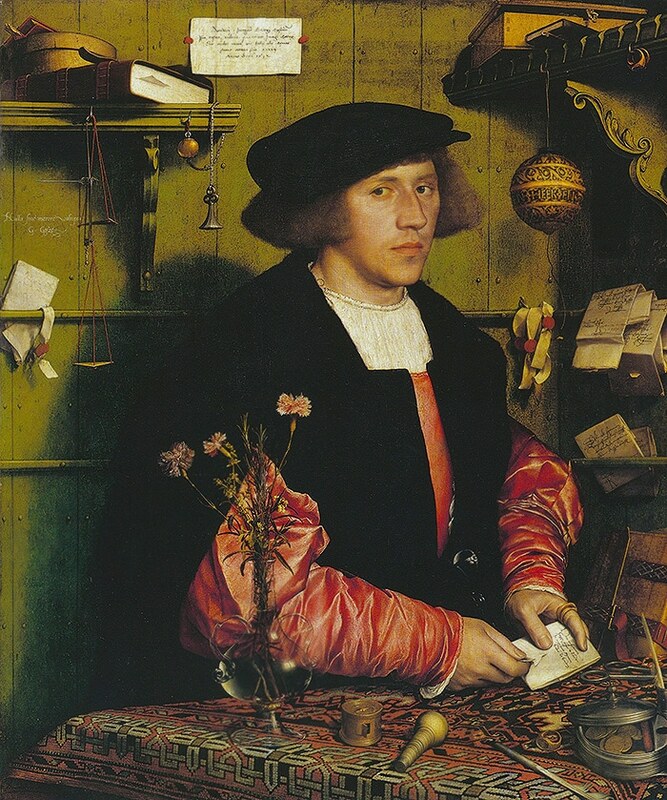 Holbein managed to circumvent criticism by church authorities because his true-to-life portraits so accurately emulated members of Basel Switzerland’s upper class society. From that point on, his fame only grew. 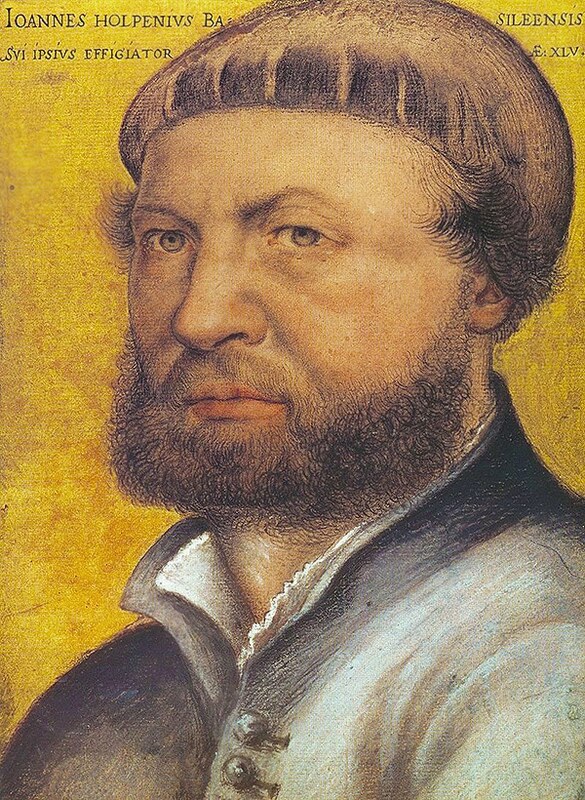 Hans Holbein’s reputation for high quality portraiture spread across England and the Continent. 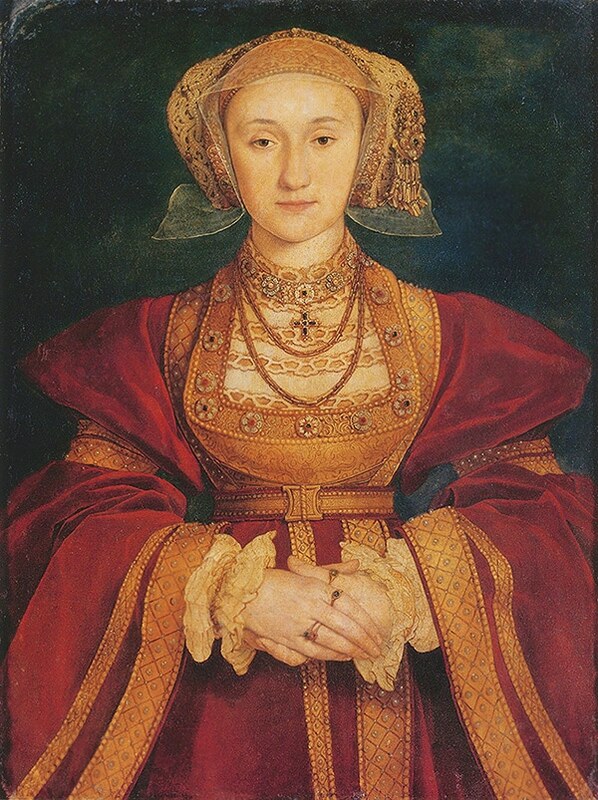 This was how he received commissions to paint two wives of King Henry VIII: Catherine of Cleves and Jane Seymour. 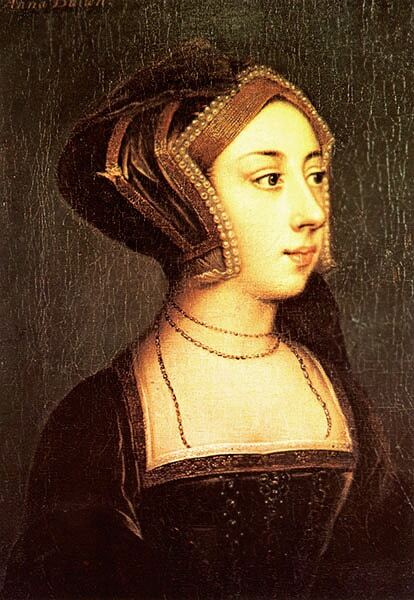 Holbein also drew renderings of two others: Catherine of Aragon and the infamous Anne Boleyn. 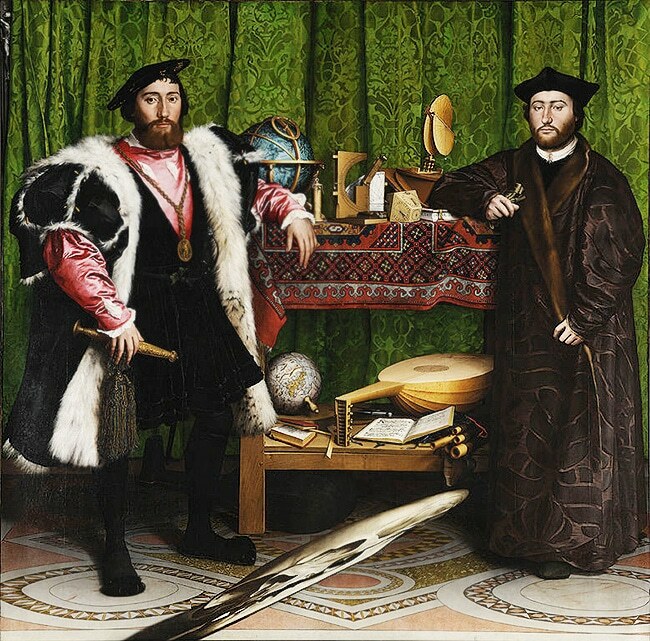 To appreciate the genesis of the Holbein rug styles, that resulted from his art work, observers must look to examples of full-body Holbein portraits. 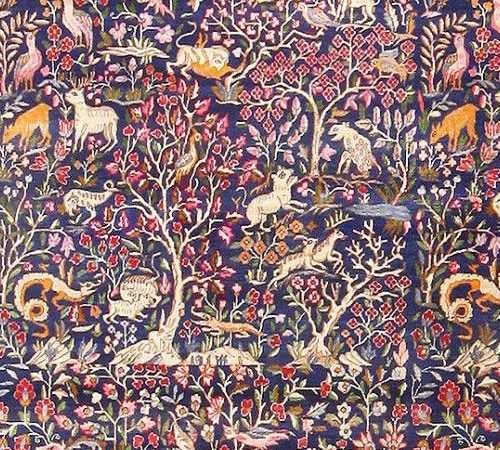 There one can glimpse the rich antique carpet and textile patterns that surrounded these iconic historic figures. 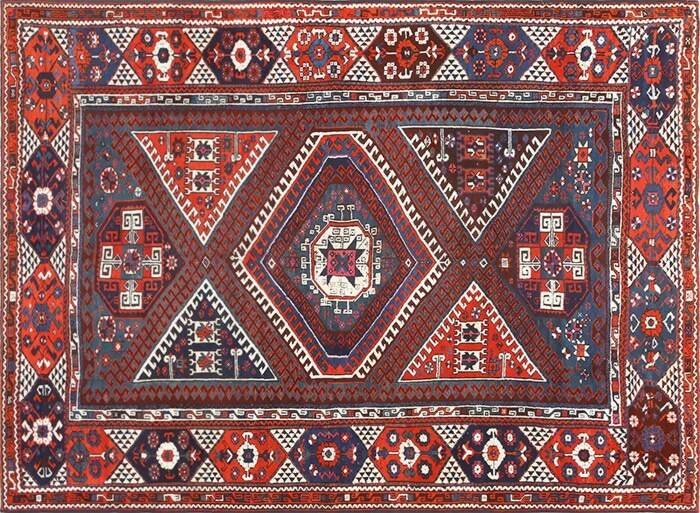 Perhaps as a homage to Holbein’s intricate patterning style, rug manufacturers began replicating them in their designs, weaving them into floor coverings between the 15th and 17th Century. 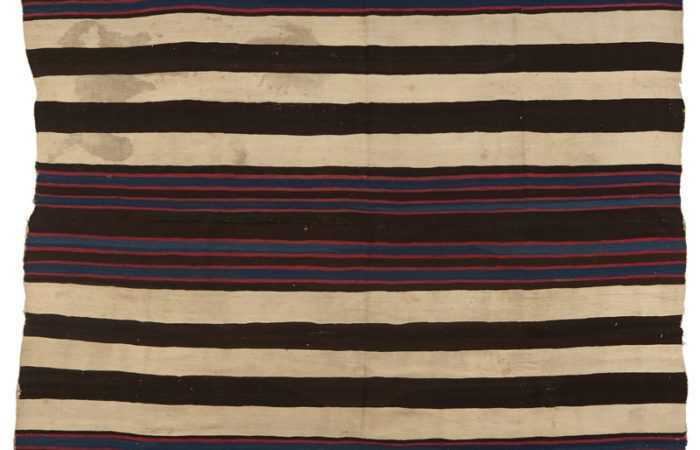 Patterns conceived on the loom took on distinct textures and appearances. 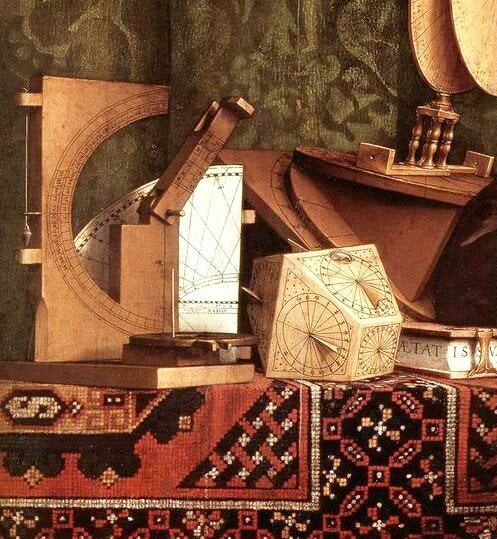 But it was the small octagonal medallions, groups of “concentric arabesques” and diagonal rows that blatantly emulated Holbein’s original designs. Who’s responsible for launching this trend? 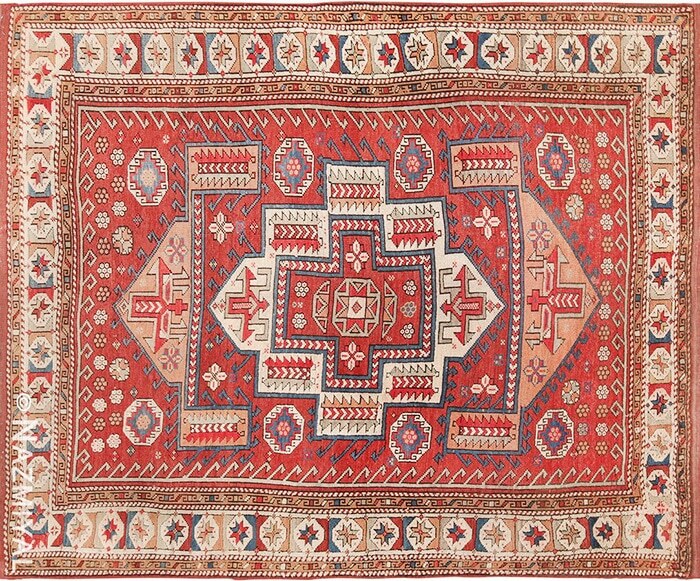 Oriental rug and textile makers throughout Turkey, and particularly those located in the nation’s Oushak and Bergama Districts. Persia’s proximity to Turkey expanded manufacturing centers where Holbein rugs were woven within the burgeoning rug crafting trade. Expanded trade routes that took Holbein rugs to all corners of the earth, created a huge demand for the rugs that featured the artist’s iconic patterns. 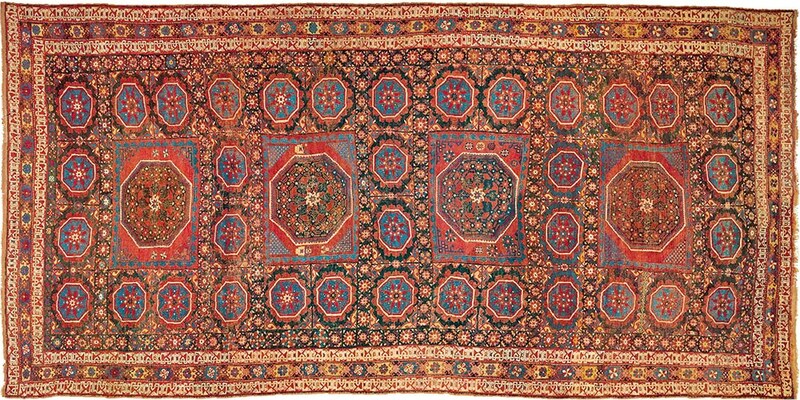 Turkey may have been the “original capital” of the antique Holbein rugs, but it was Persia’s “Golden Age” of rug making during the first half of the 18th Century that made these complex rugs even more popular and valuable. Type 1: Repeated small octagons and staggered rows of diamonds as seen in Holbein’s Portrait of Georg Gisze. Type 2: Lotto carpets feature arabesque-like foliage with branched palmettes introduced by Lorenzo Lotto who emulated Holbein’s style, thus the two equally influenced this classification (e.g., Mediash Holbein rugs). 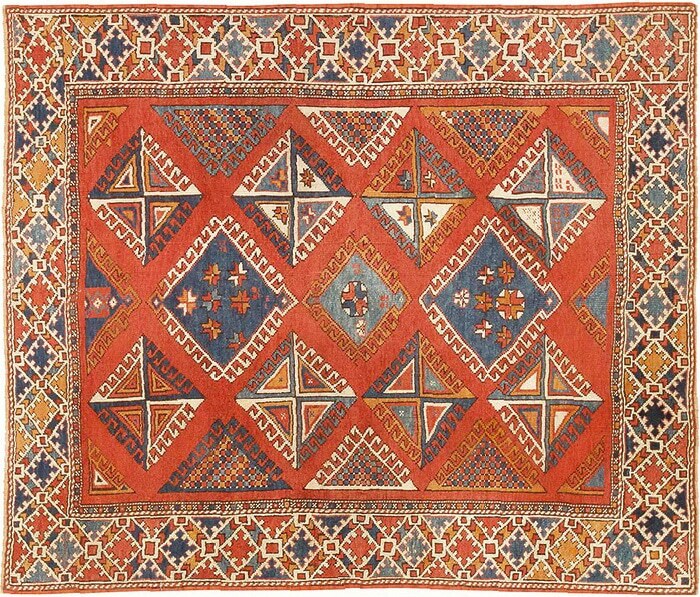 Type 4: Large-pattern, square, star-filled fields plus small squares and “gul” –octagonal medallions—plus ornaments of unequal scale identify a Type 4 Holbein rug. 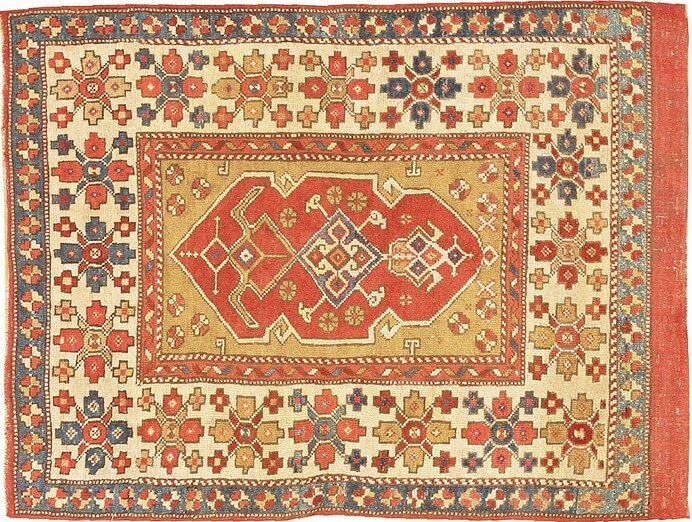 Original antique Holbein rugs were hand-loomed requiring labor-intensive efforts that dated back to pre-Islamic European societies. Hand-carded sheep’s wool was the most common yarn used to make Holbein rugs, but there was nothing common about the weavers employed to produce these masterworks. 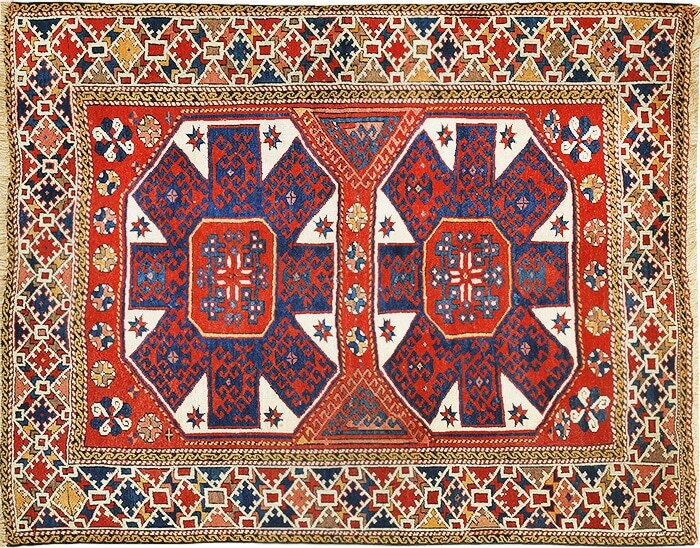 Weavers were required to possess superior skills due to the complicated attention to detail required to craft every rug. 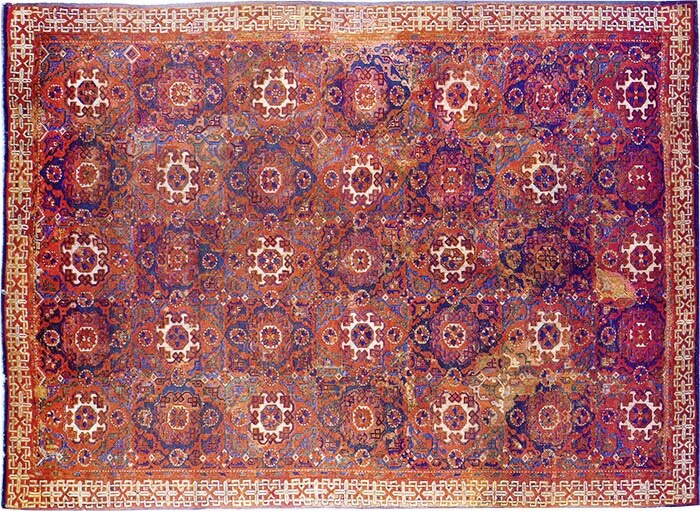 Examples of cotton Holbein rugs are rare; examples of silk-piled carpet made before 1870 in the Holbein style are even rarer. 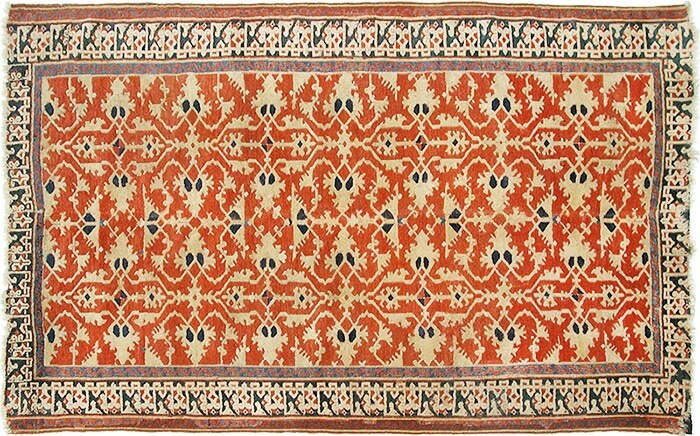 Today’s antique collector rug market for true antique Holbein rugs remains as hot as ever. The ability to carbon date these treasures makes authentication a more precise science and the popularity of the Holbein rug patterns and designs seems to have remained constant over the decades. Could Hans Holbein the Younger have guessed that his fame as a portrait artist would carry on for centuries as a result of the backgrounds and details he included in his work rather than the people themselves? Unlikely. 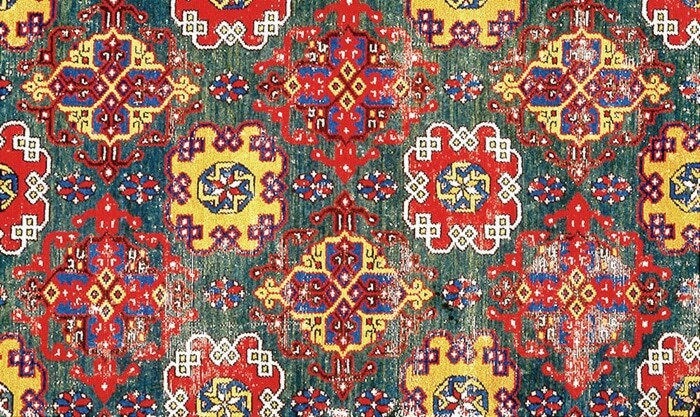 But at his death from the plague at age 46, he had already known more fame than most, so his heritage and reputation as an artist who inspired carpet patterns is both unique and unprecedented.